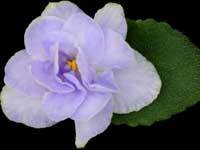 Semiminiature African violets are those that typically grow from 6" to 8" at maturity. 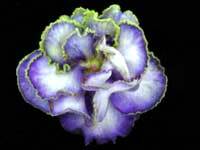 Shades of blue and green, against semidouble and double white pansies, wash across the flower face. Each flower is as unique as the art created on the beach by the ocean. The foliage is light green and lighted quilted. A good bloomer. Perky blue, single pansies, are slightly cupped. Each flower stands tall above the semiminiature girl foliage, which is heart shaped. A very good bloomer! Dark ivory, thick textured, semidouble stars. The petals are boldly tipped in rose, sporting a small amount of blue flecking about the face. 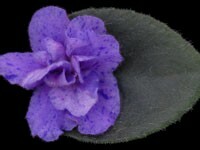 This semiminiature has dark green foliage. Single and semidouble white pansies, with upper petals touched on the edges in purple. 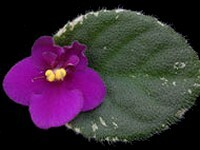 Surrounding the flower is a heavily fringed edge of green. 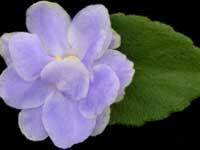 A great bloomer, with flowers standing proudly over medium green, semiminiature foliage! Leaves are serrated and wavy. Charming! White, semidouble pansies blushed with pink centers. Champion foliage of yellow and light green, against medium green, quilted foliage. Semiminiature. Soft blue, semidouble stars, have a warm yellow eye. 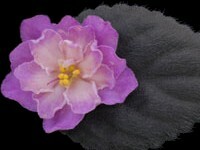 Ruffled flower petals help to make this one a real charmer! 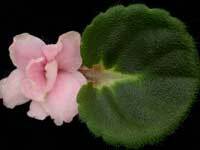 The semiminiature foliage is variegated with rose and ivory. 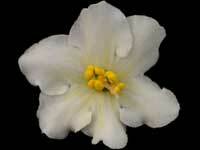 An excellent bloomer which forms a perfect bouquet of pale plum, semidouble and double stars. 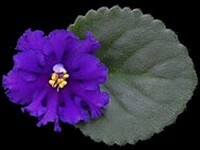 The semiminiature flowers also boast of a darker shade of plum in the eye of each flower. The medium green, serrated foliage shapes nicely and is quilted. A sport of 'Sierra Sunrise'! 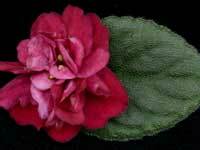 An exciting combination of burgundy colored pansies, with darker burgundy on the flower tips. It stands out nicely over the heavily variegated, champion style foliage. 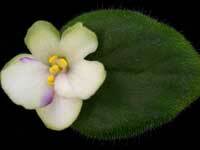 Grows as a semiminiature. Excellent for show growing! Light purple, semidouble stars are flecked and streaked with dark purple fantasy. 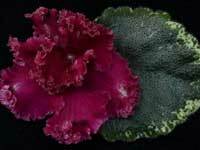 Dark green, semiminature foliage adds to the charm of this variety. A nice bloom! 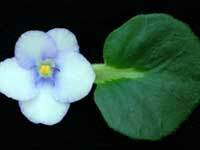 White, pansy shaped flowers, with an edge of violet/blue. A semiminiature, with girl foliage, that's medium green. A profuse bloomer sure to please! Double stars of coral/pink, speckled with blue fantasy, mainly on the flower edges. 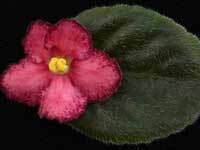 The flower center is blushed with a darker pink. 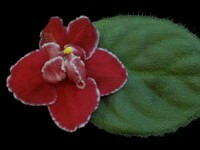 The semiminiature foliage is dark green, red reverse and tailored. A good bloomer with single and semidouble pink pansies. Blue fantasy flecks are on each flower. 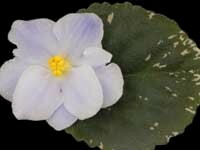 The Champion variegated foliage is semiminiature growing and shapes nicely. 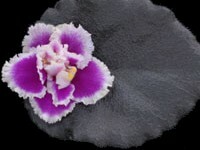 Dark maroon-red, single and semidouble pansies, with each flower surrounded with a geneva edge. The semiminiature foliage is medium green, tailored and quilted. A good bloomer! 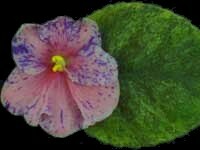 Lovely, fuchsia, semidouble and double, deeply fringed, pansy shaped blossoms, are stunning with a complimenting, wide geneva edge, over dark green, lightly ruffled, semiminiature foliage. Double white stars with a light blue mottling throughout. Light green foliage shapes nicely and is serrated. A good bloomer. Semiminiature. 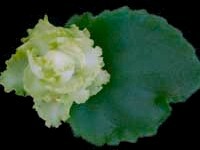 A powerhouse of small, bright green, double flowers accented with varying amounts of white in the centers, have deeply fringed edges and blanket ruffled, semiminiature, medium green foliage. We are extremely proud of this prolific little gem! 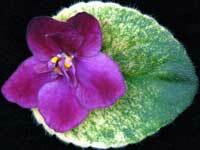 Also in the 1992 & 1993 AVSA "Best Varieties List"
This little cutie is actually a sport of our chimera "Irish Nights" (listed on our Chimera page). 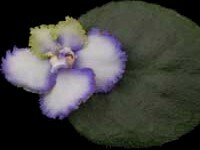 Semidouble pansies of white, with blue edges on the bottom 3 petals, and the top 2 petals are capped with lots of green! The flower edges are nicely ruffled. The semiminiature foliage is medium green. This variety definitely has "show" potential! Double, yellow and white. Light green, plain foliage. 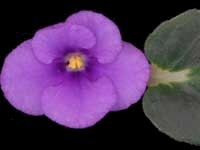 Superb growing semiminiature and desirable performer! 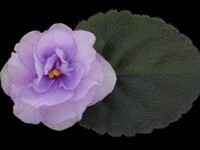 A plenitude of bright fuchsia, single and semidouble pansies make a striking addition to symmetrical, dark green foliage with white variegation. This variety has won numerous awards in shows since being released. It shapes by itself, and blooms endlessly!